When it’s time to take a break from the fast pace of life, one of my favorite places in Silicon Valley to spend a quiet afternoon is Hakone Japanese Gardens. Hidden in the hills of Saratoga, only minutes from the town center, the gardens at Hakone offer a harmonious blend of natural woodland elements and traditional Japanese design. Guests enter the garden area through a grand, hand-carved main entrance gate flanked by a pair of stone lanterns. There are four main Japanese gardens, the Hill and Pond Garden, the Tea Garden, the Zen Garden and the Bamboo Garden. Within the garden areas, historic structures, gates, bridges, and symbolic objects – stone lanterns, stones, and wood basins create an authentic Japanese cultural experience. While at Hakone, visitors easily become captivated by the sweet scent of floral blooms, the earthy smell of the woods, the splashing of water falling into the koi pond, and the colors and textures of the natural and man-made elements of the gardens. 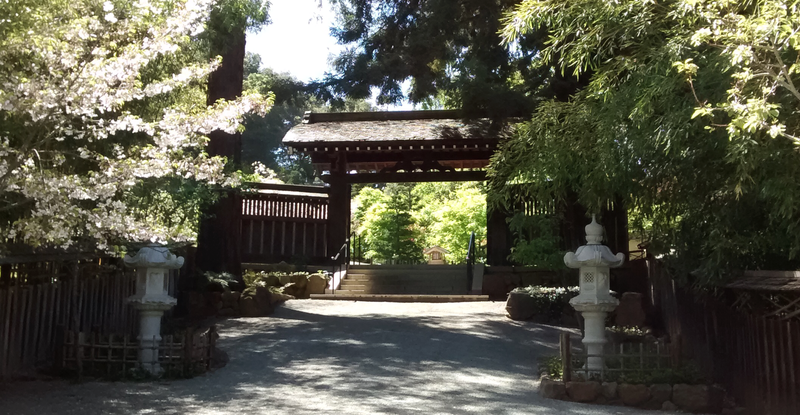 Within minutes of entering the gardens, life slows, and Silicon Valley seems worlds away from this peaceful sanctuary. Upon entering the gardens, I’m drawn to the Hill and Pond Garden where a waterfall flows over a terraced hillside into a large pond filled with koi fish. Time moves slowly watching large orange and white koi swim gracefully around the lily pond and turtles sunbathe on the rocks. A wooden Moon Bridge spans elegantly over the koi pond to a path leading to the hillside garden. Above the Hill and Pond Garden, the Upper House resembles a rustic-style Japanese residence with a curved roof, sliding paneled doors, and tatami mats of tightly woven straw. The house sits on the slope of the hill to facilitate viewing the moon from the veranda. Beyond the Upper House, a Wisteria Arbor covers the path to the Upper Pavilion. When in bloom, the lavender-blue Wisteria with its clusters of flowers and delicate fragrance provides a peaceful setting as you stroll and admire the surrounding landscape. The Tea Garden made up of stepping stone paths, Japanese maples, cypress, wisteria, and black pines is the entryway for the tea ceremony rooms. A water basin provides guests a place to wash their hands. Placed by the Lower House, the Zen Garden consists of a raked pattern of gravel and large stones that represent water and islands. The garden is intended only for meditative viewing and guests are not allowed to enter. The Lower House, historically used as a summer residence, is a blend of Japanese and California bungalow styles. A Bamboo Garden planted on the property represents the friendship between Saratoga and its sister city, Muko-shi in Japan. Sculptural lanterns made of stone stand prominent in the gardens. The stone material symbolically represents the four elements of nature: fire, water, earth, and wind. In the wooded areas, small pavilions offer a tranquil place to meditate, read a book, or sit in quiet contemplation. The colors of the gardens change with the seasons. During the winter, the muted shades of green foliage and the wood tones of bare trees and wooden structures create a serene landscape. The spring brings an energizing display of pink Flowering Cherries, Azaleas, lavender-blue Wisteria, and Rhododendrons. Summer follows with Iris, Peonies, and Water Lilies. The fall displays an array of red, gold, and burnt orange foliage. On weekdays, there are fewer visitors and more opportunities for solitude but any day is a good day to enjoy the tranquility of Hakone. This place looks fantastic. I am definitely going….and soon. Gorgeous photos too!